"What are you making, mommy?" Our friend (and blog member) Abigail has a pear tree and is up to her elbows in pears. She gave me 10 pounds (yup, I weighed them) of pears which I have converted into pears in syrup. Instead of halving them, since they were many sizes and shapes, it was easier to cut them up in a large dice. It made the final amount smaller but the quarts are more tightly packed. I also ended up with 1 1/2 cups of pear flavored light syrup to which we added water and a little ice and made a sweet pear flavored drink. The pears in syrup recipe was from the usual place, the Ball Complete Book of Home Preserving. It was actually pretty easy, and peeling 10 pounds of pears was not as bad as you might think. Better than peaches, that's for sure. 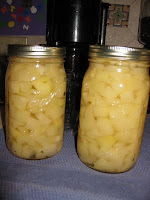 The pears were also perfect for canning, since they were crisp and not overripe. I'll be bringing a quart back to Abigail in a little while. She was thinking about making wine from some of her harvest, but I'll let her comment on that if she likes. Oh, and Abigail? I have juicer envy. The pear syrup drink is fabulous mixed with white wine. Hey Donna! The pear cider is still in process and looking pretty good. I'll be bottling it soon. Will let you know when its ready to drink. 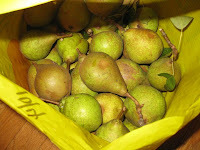 Next year I'll get started earlier and we will both get more pears!